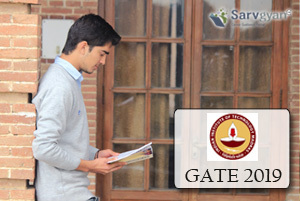 Students wishing to apply for the GATE examination can check the GATE 2019 Eligibility criteria from here. The Eligibility criteria has been released officially. Graduate Aptitude Test in Engineering also referred as GATE is a national level entrance test which is regulated by IITs & IISC rotationally. This exam will be conducted for those aspirants looking for admissions in M.Tech/ME and other programmes provided by IITs, NITs and other institutions and colleges. For the year 2019, it will be conducted by IIT, Madras. Here we are providing details about GATE Eligibility 2019. GATE 2019 Eligibility criteria has been released by IIT Madras. Click here to check criteria. There is not any minimum or maximum age limit is prescribed for this examination. GATE exams are primarily meant for the candidates those completed their degrees from a recognized university. Students appearing in the final year of the qualifying exam/degree are also eligible to apply (except in some 5 year integrated courses and AMIE etc.). There is not any minimum percentage is specified for appearing in GATE examination. No attempt limit is prescribed to apply for this exam. Candidates, those from Nepal, Sri Lanka, Bangladesh, United Arab Emirates (UAE), Ethiopia & Singapore must have to completed or are in the last year of their bachelors degree in engineering/technology or masters degree (M.Sc) in any relevant science subject. Note: If candidates is studying any higher degree or already get a degree higher than that mentioned in the above table, then candidates can select the minimum required qualifying degree while filling the application form. For any other queries related to GATE 2019 Eligibility criteria, you can ask us by leaving your comments below in the comment box. Sir,I am in final year engineering..I have not recieved degree certificte…wat am i supposed to attach in the field of degree certificate? You can get it from GATE 2019 website. I am going to complete bba.. Sir I want to study MBA . Gate exam is need for MBA? sir, I am currently persuing my final year B.tech, I am eligible for gate exam? We are in 3rd year(final ) Bsc..can we apply for gate 2018? i m 2017 pass out..sir plzz tell me what to upload in eligibilty certificate bcz i don’t have degree bcz i have one supply in 8th sem..can i upload 7th sem dmc..its enough or not..
i was completed btech in 2012 Can I apply for gate now? sir, i m bsc comp. sci. 3rd year student can i apply to gate exam? But I am in final year of BE and i have taken 5 years (4+1), so can I apply for gate 2018?? Duration of program in appendix should be 4years or 5years? IAM 2016 b.tech passed out .IAM eligible for gate2018 or not .reply me . Sir i am bsc computer science appear can gate exam? i have done my M.sc chemistry from Madurai kamaraj university, from distance learning mode. i have provisional degree certificate right now, so i want to ask am i eligible for GATE 2018? I am in 4th year of M.Tech applied geology (5year integrated).Am I eligible for gate 2018? sir,i was completed btech in 2015 Can I apply for gate now? I will complete my master degree in chemistry. What is the career options for me after qualifies the gate exam? Bsc Math can appear in GATE exam? B.sc chemistry student can be apply to gate exam?? Hey,I am from Bangladesh. I have a Bachelor degree in Computer Science and Engineering. Can i get admitted into IITs for MTech through GATE Exam? If yes then could you explain admission procedures and scholarship opportunity in details please. Thanks in advance,. I have one backlog in B.tech. I will complete that by next semester. Can I apply for a GATE 2018 Exam. Hi, I m samir. I m studing BSc with Chemistry hons…Will you please tell me that, if i complete by bsc, can i eligible for GATE n purse study for aerospace engineering in the GATE approved colleges n institutions?? I am pursuing M.sc.Zoology (2nd year) from Annamalai University,Distance education. (1)Am I eligible for GATE 2018? (2) If yes,do they prefer students from distance education background for research? Sir I complete my bsc course. Will I elligbile for it. Sir i completed BSc in previous year whatam i eligible for GATE? you can continue. There is no age restriction. I have completed Bachalor of engineering aeronautical. Now i want i want take a gate coaching for 2018 can u refer me some good institution in bangalore please. Gate is for the candidates those are appearing or completed their graduation. I am currently studying third year in Informartion and Communication Technology..Am I eligible for writing GATE..under which department should I write the exam?? I’m bsc life science and my brother is BSc non medical . Any of us can apply for gate . Pls tell us . I have completed btech in 2010 and currently doing bank job as an IT Officer from the year 2013. Can I apply for gate exam next year. If yes, what benefits will it offer from job perspective. I am completed my course in 2016 but I didn`t apply for GATE 2017. so, can I apply next GATE examination ? I have got 46.70 percentage in msc in mathematics,is I m applicable to apply for gate exam . i’ve completed my BE in 2012 and the application is not giving me that option to select am i elligible or not? No. In your case you will be completing your 4th year in 2018, GATE 2017 is for only those candidates who are either appearing in their final year or who have completed their final yr.
Sir I have completed engineering in summer 2016 but I don’t have provisional certificate , can I submit 8th sem marksheet. and sir which form like dmc or marksheet are need for fill the gate exam? sir i am in 7th sem with 3 backlog could i able to fill the gate exam now? i m last yaer B.E. (mining engineering). i shoud say to you that previous resuld are remaining due to backlog. can i submit or apply in GATE-2017. I was having backlog but had clear that in may 2016 examination but had not recieved any certificate, So what will be the better option from your point of view. As i am very much in need of giving the GATE Exam of 2017. Sir I completed my degree in this year im clear in all sem but my 8th sem marksheet is in withheld so can I able to apply form on my 7th sem marksheet??? no, you can apply for GATE after M.Sc. I have completed AMICE from ICE Delhi. Am I eligible for GATE. Sir,i am 2016 passed out graduate, i don’t have provisional yet,but I have 8th semester marks memo …is it enough for providing btech completed proof….. I have completed B.Tech in 2014 but have one paper yet to clear. Can I apply for gate? how can i register from out side of India . the online registration state is only for Indian states so pleas help me as soon as possible. I did not complete my b.tech this year due to backlog. can i submit 8th sem marksheet for eligibility certificate. I did complete my b.tech in 2016 ,but i have one backlog , i will clear that in this month only , am i able to fill gate form now ? dear sir i completed my B.E degree in 2014 .am i eligible for GATE 2017 If i am eligible which year of passing i chose. yes you are eligible. Your year of passing would be 2014.